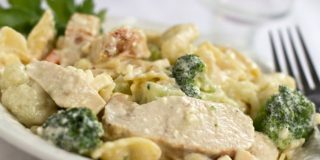 This week’s menu features chicken more than once, so to save time it is a good idea to bulk cook your chicken for both Monday and Friday at the same time. It takes less time to sauté 4 cups of chicken once than to sauté 2 cups twice. Preheat oven to 375°F. In a medium bowl, mix together cooked chicken, sautéed onion, drained red peppers, soup, water, nuts, and ½ can of chow mien noodles. Pour mixture into lightly greased casserole dish. Bake 15 minutes. Sprinkle remaining ½ can of chow mien noodles over the top and continue baking for 5 more minutes. Serve over rice. Bag mixes and a homemade dressing make this easy salad quick to make but fresh and tasty. 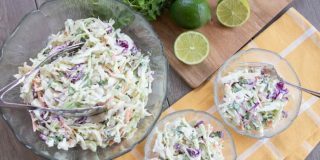 In a large bowl toss broccoli slaw, green onions, cilantro, and coleslaw mix together. In a small bowl combine vinegar, soy sauce, sugar, and both oils. Toss salad with the dressing and garnish with peanuts. 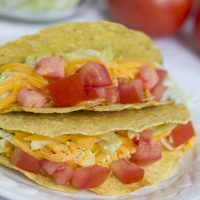 Tacos are a quick and easy meal that can be made traditional style with ground beef, or can be updated with chicken, shrimp, or even beans based on your preferences and what you have on hand. Cook and season the meat, then serve with all of the condiments taco bar style so that each person can make their own. Cook ground beef with taco seasoning mix as directed on package. Serve seasoned beef with remaining ingredients as a make your own taco bar. This flavorful salad is easy to mix in the morning and refrigerate until serving with dinner. Mix all ingredients. Refrigerate for a couple of hours before serving. Place vegetables in the bottom of a slow cooker. Sprinkle tapioca over the vegetables. Place chicken on top of the vegetables. Combine all other ingredients except rice in a small bowl. Pour over chicken. Cover slow cooker and cook on low for 8-10 hours. Serve over rice. I learned this quick and easy egg drop soup recipe when I was living in Japan. It’s good for a light appetizer or a comfort food when you have a cold. Bring broth to a boil in a medium saucepan. Add salt and pepper. In a small bowl, beat eggs and add onions to beaten eggs. Pour eggs into boiling broth slowly, stirring with fork so that egg forms into ribbons. Soup is ready when egg is cooked. Preheat oven to 350°F. Cook pasta according to package directions. 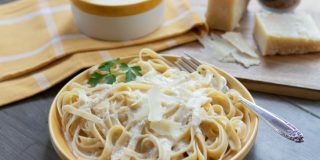 In a medium sized bowl, mix ricotta cheese, Parmesan cheese, egg, salt, and pepper together until thoroughly blended. 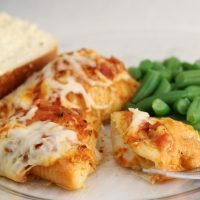 Stuff shells or manicotti with cheese mixture. Place stuffed shells in a 13″ x 9″ baking dish lightly coated with non-stick cooking spray. Spoon marinara sauce over each shell; sprinkle with mozzarella cheese. Bake for 20-30 minutes or until bubbly. Combine soup, chicken broth, and sour cream. Set aside 1/2 of this mixture. To the remaining mixture add chicken, onion, pepper, chilies, Rotel, and spices to taste. Add 1 cup of the cheese. Place 1/2 cup of chicken mixture onto each tortilla, roll up, and place the tortillas seam side down in a 9×12 pan. Pour the reserved soup mixture over enchiladas. Sprinkle remaining cheese over enchiladas. Cook at 350°F for about 25 minutes or until bubbly. 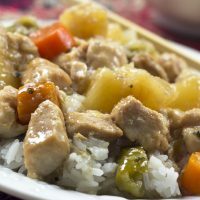 Although this recipe instructs you to sauté the peppers and onions, if you are using the Secrets of a Busy Cook, you will have prepared onions, peppers, and chicken in your freezer to use in this recipe. The principle of preparing frequently used ingredients in bulk saves lots of time in the evening, but doesn’t add much time on the front end. When you are cooking onions for a meal, cook up a whole bag instead of just one, then freeze the rest. 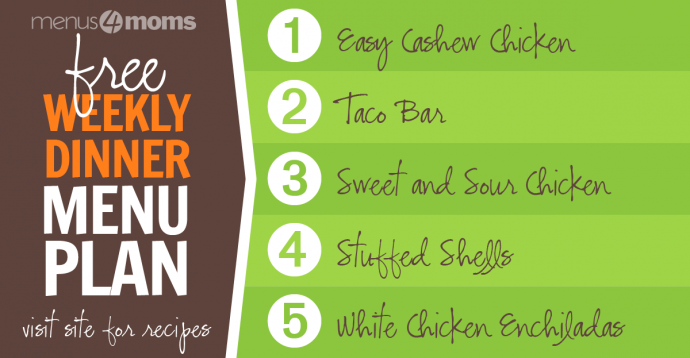 If you do this often with common ingredients, your time in the kitchen will be much more efficient.